"Doyle is not the first jockey to find the USA is a land of opportunity"
No wins from 85 rides – not a statistic that would have given Sophie Doyle much pleasure back in 2012, when the then British-based jockey would reflect on her most disappointing spell in the saddle. Her best year had been 2010, with 28 victories from 249 rides for earnings of £129,000. At a time when her brother James’s profile was on the up – a Group 1 win on Cityscape in March 2012 would help propel him on to retainers with Khalid Abdullah and then Godolphin – Sophie took the decision to relocate to America in a bid to resuscitate her career. For someone who describes herself as a “home bird” it was a brave call – yet, as results suggest, undoubtedly the right one. Up to September 20, Doyle’s US career showed 2,167 rides for 217 winners and earnings of $5.2 million, including a Grade 2 triumph on Fioretti in the Thoroughbred Club of America Stakes. This year is certain to be her most successful yet Stateside, with 69 winners so far, the majority of those coming at Arlington Park – at the time of writing and with two days of the season left, Doyle was third in the standings at the Chicago track, having passed the 50-winner mark with a fabulous four-timer on September 20. Doyle is not the first jockey to find that the USA really is a land of opportunity – in April we spoke to Adam Beschizza, who had a terrific season at Fair Grounds in New Orleans – but one suspects that being an outsider and female would make things that bit harder, as the jockey herself suggests. “You have to work twice as hard to be a professional female jockey, in England, America or anywhere in the world,” Dolye tells Tim Richards. “Persevere, believe in yourself and at some point it will pay off. There is a very good saying, ‘Hard work can overcome talent.’ Female jockeys have realised they have to work just as hard and be just as fit as the next one, male or female. “[Initially] it was very tough making contacts – I didn’t have anyone to help me. I was at Santa Anita and Hollywood Park in California and got in touch with trainers and told them I wanted to continue my career as a jockey. “I wanted to work for as many trainers as possible and would walk through the barns talking to trainers and their staff, trying to establish relationships. Doyle is now a rider in demand, which is an achievement in itself, big-race winners aside. How many female jockeys in Europe would take seven or eight rides on a single card? 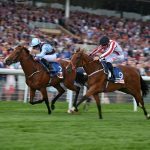 The racing programme may be different in the States, with jockeys basing themselves at one track for a number of months, yet Britain, it seems, is still behind the curve when it comes to equal opportunities in the jockey ranks. Interestingly, when Doyle endured her toughest season in the UK, three of the top 50 jockeys were women. Fast forward six years and, perhaps surprisingly given the number of young women coming through, the situation is identical. Let’s hope in another six years the scene has moved forward. This month sees Britain’s richest day of racing at Ascot on Champions Day, which has given the Flat season a wonderful finale. James Oldring, who has been involved since British Champions Series was launched eight years ago, he explains how successful the event has been from a commercial and promotional perspective and why if he’s losing sleep ahead of this year’s spectacular on October 20, it won’t be because of the racing.